In the last A to Z, E was for elephants on a stamp from Spain. 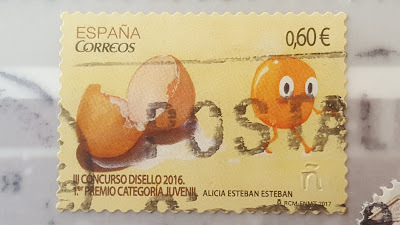 This time the E is for Egg and Eggshell on a stamp from Spain. They were both winners of a stamp design contest and formed part of the same issue. For more links to E on stamps, head over to Sunday Stamps. That egg yolk looks a little shocked. I wonder where it is running off to?! 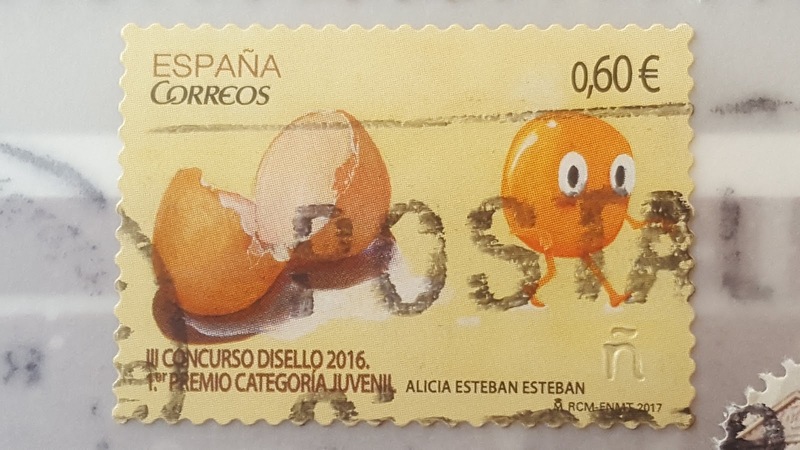 The first egg shell I've seen on a stamp, takes the imagination of a teen to come up with that. Like she gets her name on the stamp. Thanks for the explanation, Eva. I also like the fact that the designer gets a little bit of fame for their work. I wonder if any amateur contest winners ever go on to become professional stamp designers. I think it is a good way to get young designers interested in philately. There are some prices. I still have to send you this year's winner! I look forward to it - and I will avoid finding it online so it will be a nice surprise.